At long last, I have stopped moving long enough to pen a legible letter to you. The steamship from San Francisco made port in Humboldt Bay early yesterday morning, and before I even had time to realize where I was, Aunt Hazel had me settled into my own upstairs room, a cup of tea on the night table and a bath drawn to wash away the soot, sweat, and salt of the past nine days. Whether I’ll ever launder it all out of my traveling skirt remains to be seen. You were right, Papa, that it would be hard travel, but I did love it, even the stark expanses of Utah and Nevada. There were reminders along the way that many had come before us, and under far more wearying modes of travel than a modern rail car. At one place I saw a chifferobe that had long ago fallen from some passing wagon, the wood bleached white as bone. I had to wonder what sorts of creatures were now at home in those shattered drawers — scorpion, spider, snake? Miles on, the whole lot of us were in a grim temper — no surprise, hot and dusted with cinders as we were — and as the train toiled up into the Sierra Nevadas, there commenced some especially black jesting about the Donner Party. I confess to having joined in, which made a woman sitting near me cover the ears of her little boy. I sigh even now to remember her expression and my realization that I had (once again) trampled the invisible line of female propriety that has always been so elusive and troublesome. Will I ever learn? When we dropped into the Sacramento Valley, there were, as far as we could see, fields of wild sunflowers, their faces no larger than the palm of a man’s hand, spread out on either side of the tracks. Our entire company actually broke into hurrahs to see it — California! Papa, I’ve nearly emptied the inkwell, and not even begun to tell you about Eureka — it is a rough place, and glorious. I’ll write soon and tell you how I’m settling into my adventure. What I miss most, already: brushing the sawdust off your shoulders right before supper. My best love to my best fellow. The starving time. Each spring, this is what the people in the village called the lean months, when the best mushrooms were gone from the woods and spring greens had not yet come up. Ya Zhen was sixteen, a slender girl, tall like her father. Her hands and arms were strongly corded from a great deal of physical work. Today she huddled under a blanket, trying to keep her small brother distracted so that he would stop complaining of hunger. She could not stop thinking about an egg, how the yellow yolk would coat her tongue. But the last hen had stopped laying and gone into the pot long ago, feeding them and feeding them, first with parceled bits of flesh, then smoky traces of marrow, and finally broth, diluted a little more each day until it was a sip of hot water infused with the memory of chicken. The rain was relentless. For weeks, the unbroken wall of water between the river and the clouds had sent the fish into hiding. Their mother sat by the ashes of her cooking fire, hands resting in her lap, palms up. Earlier in the morning she had raked through the cold char, looking for a bit of fish or rice that might have fallen in the fire days before, something she could feed her son. There was nothing. The night before, she had fixed a last bit of porridge and given it to the boy. But there had been no breakfast and now the afternoon mealtime was long since passed. Hong-Tai crouched under the blanket with her, his pupils large in the dark. “I am going to eat the hunters,” he said, baring his small, square teeth. He was six years old, tall for his age with a long face and prominent cheekbones, like their father. Their mother turned her head slowly, face blank, as if she could not hear him. “Give me food!” He raised a hand as if to strike. Ya Zhen grabbed his arm and led him outside. The yard was boggy with mud, but the clouds had thinned enough that she could judge the sun’s position low in the sky, a luminous gray spot behind the darker gray overcast. “Let’s find worms and try fishing again,” she told Hong-Tai. She didn’t want to leave her mother alone, but an empty belly compelled her. Their father had left five days ago, down the mountain to try to sell the meager remnants of last year’s millet crop. It was the last bag, saved back for seed, but the fields were too wet to plant and he feared the seed would mold if he waited any longer. He had promised to bring back food and should have returned after three days. “Tigers don’t dig for worms,” Hong-Tai said. He folded his arms over his chest. “Mā will cook the fish for me.” He ran to the maple tree at the corner of the hut, broke off a small branch and handed it to his sister. “I’m not really a tiger,” he said. After a few minutes digging with the branch, they had a writhing ball of red worms in a reed basket. While Hong-Tai gathered damp grass to cover them, Ya Zhen returned to the house for their tackle, a plain bamboo pole strung with twine and hook. Her mother had gone to the bed and curled on her side, facing the wall. Most of her hair had come loose of its knot at the nape of her neck and it trailed out on the bed behind her like weeds floating at the riverbank. “Mā,” Ya Zhen said. She touched her mother’s shoulder. “We’re going to fish.” Her mother did not stir. It had always seemed to Ya Zhen as if her frail mother had one foot in the ghost world. “We’ll be careful. I’ll keep Hong-Tai with me.” She went to the door. “Bà will be home soon,” she said, almost in a whisper. Her mother’s back looked thin as a child’s and she did not reply. Ya Zhen could hardly make out the rise and fall of her breathing. Normally she would cast bits of rice onto the water to tempt fish to the surface, but she had no rice, no millet. She didn’t need it. The long rains had indeed made the fish ravenous. She baited her hook and had a fish on the line immediately. The live thrum quivered into her palms and she drew it to shore with the utmost care. After landing three small trout, she let Hong-Tai take a turn. In seconds, he had a strike. “Tǎ jà,” he shouted, jumping from foot to foot. She helped him pull the fish — a big one, easily twice the size of hers — onto the bank and showed him how to retrieve the hook. He was so excited he cast in again before baiting the line and nearly tossed their pole into the river. They pulled the line in and he turned the fishing back over to his sister, squatting to admire his own catch. After she pulled in a fifth silver trout, Ya Zhen cleaned them on the riverbank, throwing the entrails back into the water and wiping her bloody fingers on a hank of moss. Hong-Tai, still squatting, watched. “This one for me.” He pointed at the largest and smoothed its tail with a grimy finger. This high in the hills the river ran fast and cold; the flesh of the trout was firm, pink. Ya Zhen’s mouth watered and she wanted to bite into the fish raw. She knocked the few remaining worms onto the dirt, wrapped all five fish in clean leaves and tucked them into the basket. The thin spring sun had dipped behind the peaks, throwing the small valley into early twilight. Her fingers were bright red, numb from the water, and Hong-Tai shivered. She rubbed his arms through the thin fabric of his jacket and proposed they race to see who could get home first to start the fire. He sprinted ahead of her, pigtail bouncing from shoulder to shoulder. She was ten years older than Hong-Tai and had been a second mother to him from the beginning. Her father, always distant with the girl, had been transformed when his son was born. She could perfectly recall how animated his face became when the midwife brought him news of a male child. It seemed to Ya Zhen that overnight her taciturn father became young, as if his face was lit from inside. He had showered Mā with small affections and gifts and had carried Hong-Tai around so much that the women in the village began to call him nán yín pú: little mother. His eyes skimmed her face and then looked past her, at the mountain. “Come and eat.” He turned and she followed him inside. A cooking fire now warmed the hut. Ya Zhen’s mother poured hot tea, and she had made porridge. On the table were opened parcels of food her father had carried home: rice, with which her mother had made the porridge, and pickled radish to eat with it; strips of salted herring; and sticky buns with bean paste, as if they were celebrating the new year again. Ya Zhen gave the basket of trout to her mother, who was busy filling Hong-Tai’s bowl, smiling. It seemed impossible that she was the same woman, earlier left in the bed with her face to the wall. Ya Zhen put food on her plate, her mouth watering when she smelled the pickled vegetable. She went to a low stool near the hearth. The porridge was hot and creamy, and she felt it warming her, filling her belly while she watched her father and brother eating at the table. Hong-Tai tore a dumpling open and licked out the creamy paste. He stuck out his tongue and crossed his eyes trying to see it. Ya Zhen covered her mouth and laughed. She waited for her father’s reaction; it seemed she had spent all of Hong-Tai’s life, six years, trying to learn something about her father by watching him watch Hong-Tai. She was surprised. He was not looking at the boy, but at her, leaning back in his chair, his unshod feet stretched toward the fire. When she caught his gaze, he looked away, scratching his head. After they had eaten and the table was clean, her father brought more packages out. The first he gave to Hong-Tai. It was a suit of clothes, the pants and tunic made of heavy brocade, dark blue, and a new jacket, thickly padded with a tall collar that reached the boy’s chin. “Look, Tǎ jà,” he said to Ya Zhen. He ran to her and turned slowly, holding his arms out stiffly to his sides, face solemn and pleased. “Come here zǎi,” their mother said. She drew Hong-Tai close and held his face between her palms. “My handsome boy.” Hong-Tai leaned against her, looking down at his new clothes. “So much money for the seeds,” she said to her husband. He looked at her levelly, then at Ya Zhen. He pushed the last parcel across the table toward her. “Take this,” he said. Ya Zhen was so stunned by the offer of a gift that she had to look at her mother first, thinking she must be mistaken. Her mother’s eyes were large and surprised in the firelight. She nodded at her daughter. She opened the thin paper carefully, so that it could be used again. There was a garment, brilliant scarlet. Ya Zhen stood and held it up. It was a wedding robe, embroidered with gold thread, peonies and cranes. The fire glimmered on the patterns. Ya Zhen felt thunderstruck, as if every thought had been swept from her mind. But somehow her body knew; her hands began to tremble and tiny reflections shimmered on the walls of the small room. When her mother moaned, Ya Zhen’s knees buckled and she fell back onto the stool hard enough to make her teeth click together. Ya Zhen’s mother shook her head in tiny arcs, no no no. She looked from father to daughter, father to daughter, tears beginning to slide down her cheeks. Then she looked at Hong-Tai in his beautiful new clothes. Ya Zhen’s father made two long strides across the room and slapped his wife hard on the face. He was a tall man, as were many men from the north, and Ya Zhen’s mother staggered and fell onto the bed, blood on her mouth. Ya Zhen felt rooted to the earthen floor, like an old cypress holding her place in the world by habit. Their father had often spoken roughly to them, but Ya Zhen had never seen him strike their mother. Hong-Tai saw his mother’s blood and screamed. He ran to Ya Zhen, buried his face in her neck, weeping. Her father stood panting, and looked back at Ya Zhen. “Tomorrow you will travel to meet your husband in the south. Take some of this food for your journey.” Without looking at her, he told his wife to get up, to help Ya Zhen prepare to leave. “It will be at first light,” he said. He picked up Hong-Tai. The boy tried to hold onto his sister, but his father spoke sharply to him. “We will take care of night business now.” This meant carrying a last bucket of water from the well, splitting some kindling for the morning fire, and going to the latrine. Hong-Tai looked at Ya Zhen over his father’s shoulder as he was carried out. His wet eyes were large in his face. “Mā,” Ya Zhen whispered. Her mother had curled up, just as she had earlier in the day, weeping quietly. The girl stood, fighting the ragged, wobbly sensation in her legs. She found the cloth her mother used to wipe the dishes and wet it in the drinking bucket. “Mā,” Ya Zhen said again, pulling gently on her mother’s shoulder. Her mother let herself be rolled onto her back like a child. Ya Zhen brushed the hair out of her face and winced at the deep gash on the corner of her mother’s mouth. The flesh of her cheek was smeared with blood and was swelling, the perfect outline of her father’s hand rising there. Ya Zhen wiped at the blood as gently as she could. Her mother did not flinch or pull away, but her eyes opened. When Ya Zhen rinsed the cloth and reached out to wipe her face again, her mother gripped her wrist and took the cloth. She sat up and pulled Ya Zhen to her. Ya Zhen could not remember her doing this since she was a tiny child. The strength in her mother’s arms surprised her, and she relaxed into the embrace. Her fear filled her like a raw tide, and she allowed herself to weep. “No, Mā. No, Mā.” She said it over and over, and her mother rocked her back and forth. She cried until her throat was raw and she was no longer making real sound, just a keening that she felt in the center of her head. When she had no more strength to weep, she sagged against her mother and simply breathed in the light, earthy smell of her. By the time her father brought Hong-Tai back into the hut, nearly asleep on his feet, Ya Zhen’s mother had wrapped the girl’s few possession in a bundle: a wooden comb, a second shirt, a small pile of sunflower seeds twisted in a corner of the paper her father had packed the parcels in. She also wrapped the bits of food left over from dinner, and finally the wedding robe. Before she tied everything up, she went to the bed and got on her hands and knees. From far underneath she pulled a small wooden box. It was plain, no scrollwork of any kind, but the finish gleamed like pooled honey. Her mother set the box on the table and lifted the lid. She brought out a pair of chopsticks, polished ebony. On the end of each one was a jade inlay, a meticulous dragon with a small seed pearl eye. “My mother gave these to me when I married,” she said. “They have fed all your grandmothers.” She tucked the chopsticks into the bundle and tied it in a snug roll. “This will bring luck,” she said. “You must learn to want differently.” Her mother leaned her head close to Ya Zhen’s, her face grim. “Now you are the daughter of your husband’s mother.” The words were so simple, the way she said them, and each one fell like a stone onto Ya Zhen’s heart. Her mother took up the broom, swept ashes back into the hearth with her back turned. It seemed to the girl that her mother grew smaller, receding even as she stood in one place, while the little sounds of the stiff bristles making their whist, whist raised an impenetrable hedge between them. After what might have been a very long time, or only moments, there were footsteps outside. Ya Zhen’s mother touched her own bruised and swollen face. 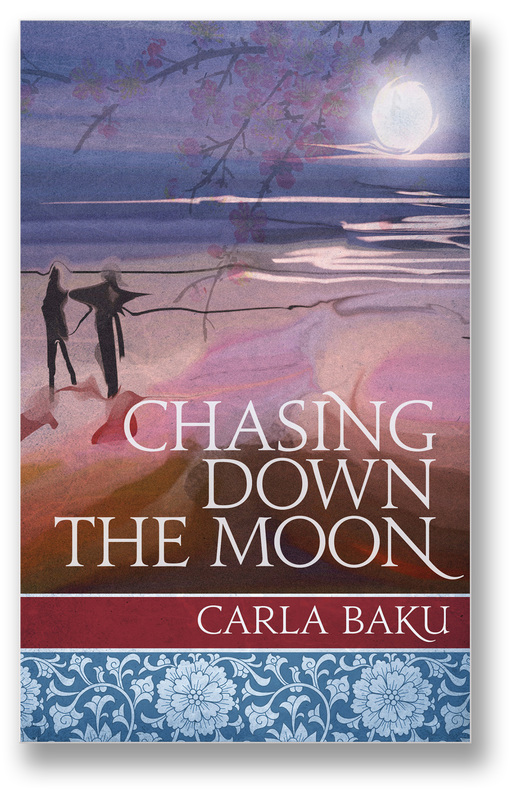 We hope you've enjoyed this short excerpt of CHASING DOWN THE MOON. For a longer sneak peak, please visit the "Look Inside" feature at Amazon.com.